Marked as special at an early age, Jacinda knows her every move is watched. But she longs for freedom to make her own choices. When she breaks the most sacred tenet of her kind, she nearly pays with her life, only to be spared by a beautiful stranger sent to hunt those like her. For Jacinda is a draki--a descendant of dragons whose ability to shift into human form is her best defense. Forced to flee into the mortal world, Jacinda struggles to adapt. The one bright light is Will. Gorgeous, elusive Will who stirs her inner draki to life. Although she is irrestibly drawn to him, Jacinda knows Will's dark secret: He and his family are hunters. She should avoid him at all costs. But her inner draki is slowly slipping away - if it dies she will be left a human forever. She'll do anything to prevent that. Even if it means getting closer to her most dangerous enemy. I picked up Firelight because a good friend of mine read it and told me she really liked it, and I must say, I'm glad I did! Jacinda has been special since she was 11 - the age when she 'manifested' or first turned into a draki (a dragon). Why? Because Jacinda doesn't just turn into any old dragon - turns out she's a fire-breather, the first her pride has seen in generations. Because of her uniqueness, Jacinda is treated differently even among her own people. She's been 'bonded' to the son of the alpha - the dark, brooding Cassian - and the others are constantly monitoring her, making sure she stays within the pride's boundries. The pride wants Jacinda and Cassian to get busy and make some more fire-breathers, but Jacinda wants nothing to do with the self-centered jerk who happens to be the object of her twin's affection. Jacinda feels bad enough when it comes to her sister, who never managed to manifest at all and is treated like a leper by the entire pride. To make matters worse, Tamra was good friends with Cassian before it was found that she wasn't a draki. In the first few pages, we are introduced to Jacinda and her friend Az, (who I wish was more present in the novel, but I digress). The girls snuck out to fly at sunrise (a biiiiig no-no), and have been spotted by a group of Hunters - humans who hunt and kill draki, then sell their bodies to a mysterious group that nodoby knows much about. Trapped by the Hunters, Jacinda jumps out of her hiding place in order to distract them while her friend escapes. It works, but Jacinda can't lose the Hunters, and she's chased to the edge of a small body of water. She finds shelter and hides, but she's quickly found by one of the Hunters. Preparing for her final moments, Jacinda is shocked when the Hunter chasing her gets close and... leaves. For no reason. He leaves her there, unharmed and confused - why did the mysterious stranger spare her life? Jacinda returns home, where trouble awaits - she's in big trouble for breaking the rules yet again, but that's nothing compared to what happens next: her mother loads them into the car and flees from the pride. That's it for my summary! Hopefully I managed to peak your interest, because this book was really great - so great, in fact, that I stayed up late two nights in a row just to get more reading in. Firelight was one of those books that you can't put down, ya know? You get so pulled into the world of the draki that you don't want to stop until you find out what happens next. The plot twist were great, and even though I thought I knew what was going to happen next, I often found myself going, "what?!?! NO!!!" And you know what else? I found myself very in-tune with the main character: my pulse would speed up when she was in a scary situation, and I felt her desperation and frustration with the situation she was in. For more info, visit the author's official website! Click here to view the book trailer! I love this review!! I want to read this book! Thanks....I found you on Book Blogs and am a new follower. Hope you will check out my blogs and possibly follow-back. Thanks Laurie! It's a really good book - I really think you'll enjoy it! Hey new follower here! Found you at book blog! Like the set up! Stopping by via FF! WOW! What a fabulous review! 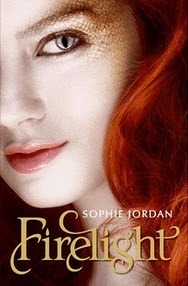 I haven't had the chance to read Firelight yet, but I can't wait to get my hands on a copy! I'm a new follower now! So please take some time and stop by my blog! Follow me back if you like!